With the release of the Tablets and the Smartphones most of us are now already getting used to the touchscreen keyboards. Some of these devices also come with other physical keyboards which were attached either by Bluetooth or connected by some docking mechanism. It seems like most of the users are still more comfortable with the physical keyboards. 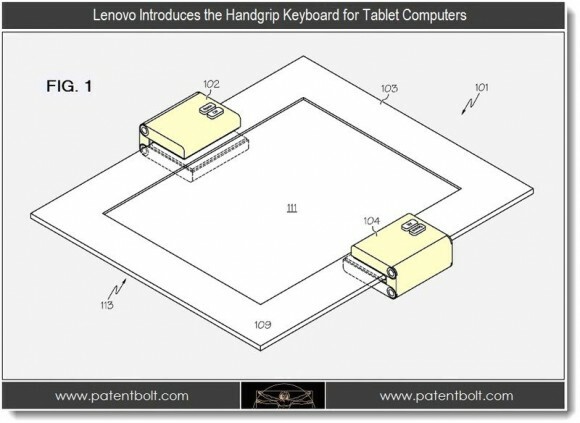 Lenovo seems to busy in developing another new design with a folding handgrip, it’s a keyboard that could fit any number of devices. This design is also expected to resolve the problems like the bulkiness of the devices when attached to an external keyboard and the keyboards fitting to only specific tablet. This handgrip keyboard was discovered by the Chinese company earlier in 2010, but was not disclosed to others until earlier this year. This design actually consists of two keyboard sections that fold around the tablet for grip. 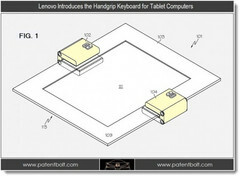 This keyboard will interact with the tablet by the means of Bluetooth or infrared. Although it looks a bit different from the regular keyboard but it follows the QWERTY standard of keys apart from that several different layouts are also thought to have been made. As the grip covers both the front and back of the tablet keys will be made available on both the sides of the tablet that is on its front and back. With this design the users will also have the freedom to use the section according to them, now they can even put the keys underneath their fingers or thumbs when gripping the tablet. There is no word from Lenovo yet about when; we should expect to see this product in the market. This product really has a plus point over the typical keyboard as they don’t need much space and as it is wireless it will not even block any of the ports. While using one of the grips it will also be able to provide a new experience along with the touchscreen.